Otto Warmbier was arrested while on the "New Years Party Tour." 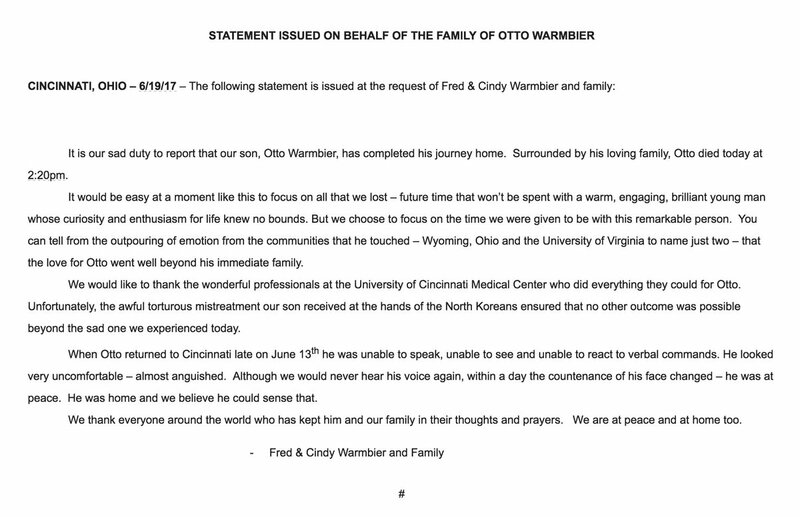 Otto Warmbier, in an official statement released by his family, was declared dead today. Warmbier, an American student at the University of Virginia, was visiting Pyongyang, North Korea, on a tour organized by Young Pioneer Tours when he was imprisoned over alleged efforts to remove a propaganda sign from his hotel. He was held in North Korean custody for 17 months before being medically evacuated last week. Warmbier left North Korea in a coma which was at first attributed to botulism but medical tests showed severe brain damage, putting North Korea’s claims of food poisoning in doubt. During a news conference following Otto Warmbier’s return, his father, Fred, lashed out at the tour company: “The North Koreans lure Americans to travel to North Korea via tour groups, run out of China, who advertise slick ads on the internet proclaiming, ‘No American ever gets detained on our tours’ and ‘This is a safe place to go,’” he said. Extremely safe! Despite what you may hear, North Korea is probably one of the safest places on Earth to visit. Tourism is very welcomed in North Korea, thus tourists are cherished and well taken care of. We have never felt suspicious or threatened at any time. In fact, North Korean’s are super friendly and accommodating, if you let them into your world. Even during tense political moments tourism to the DPRK is never affected. People ride bicycles on August 23, 2015, in Pyongyang, North Korea. But, in light of recent news, the China-based Young Pioneer Tours is still offering the “New Years Party Tour” they sold to Warmbier. The University of Virginia student was arrested at the end of his tour, at the Pyongyang airport, suggesting that he still would have had the chance to watch the end-of-year fireworks celebration from Kim Il-sung Square in the city center and take a helicopter ride in a Russian Mil Mi-17 around the area as promised on the tour company’s website. This particular tour costs €995 (plus an extra €200 for the helicopter ride), departing from Beijing for a five-night, six-day excursion into the DPRK. Including the chopper ride, that’s about $1332. There’s also a budget version of the trip for €445 (or $500) for half of the duration. About 4,000-5,000 Western tourists pay the heavy sums for state-sponsored tours of hand-picked North Korean venues. Young Pioneer upsells the adventure — “we do group tours for people who hate group tours” — and breathlessly describes itself as the “budget travel to destinations your mother would rather you stayed away from” on its homepage. The next tour on offer this year is the “Summer Pyongyang City Bicycle & DMZ Tour,” which begins July 3rd. The tours are pegged to the seasons and holidays with the activities that reflect the time of year. Though it seems drinking is encouraged regardless of when on the calendar you find yourself north of the DMZ. If you’d like to plan ahead, they have 37 tours scheduled for 2018. A company representative attested to that fact, telling the New York Times, “We have taken more than 8,000 tourists into North Korea over the last 10 years with only one arrest.” Still, Secretary of State Rex Tillerson is considering raising restrictions on Americans traveling to North Korea. Currently, three Americans remain in North Korean custody. We have reached out to Young Pioneer Tours for comment and will update when we hear back.